Vaplite [«Вапліте»]. The official organ of Vaplite. Its editorial board consisted of Mykola Kulish, Ivan Senchenko, Oleksa Slisarenko, Pavlo Tychyna, and Maik Yohansen. Only an almanac and five issues of a journal appeared. 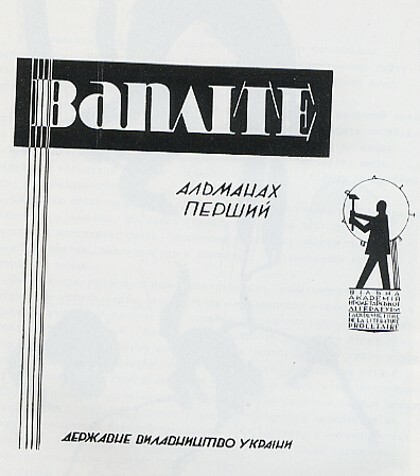 The almanac (1926) consisted of articles on cultural politics and literary topics submitted by five members of Vaplite and the Comintern figure V. Serge (Kibalchich), Vaplite's statute, and a literary chronicle. 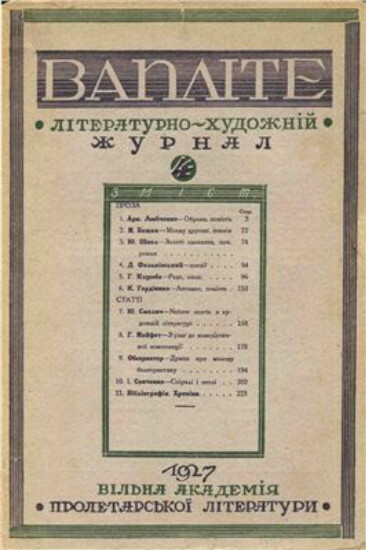 The journal issues (1927) contained poems and prose by Vaplite members and other writers (eg, Nadiia Surovtsova, Vasyl Stefanyk, Nykyfor Shcherbyna, Kost O. Hordiienko, Dmytro Falkivsky, Hryhorii (Heo) Koliada); polemical and theoretical articles and literary criticism (including articles by nonmembers, such as Yarema Aizenshtok, Ye. 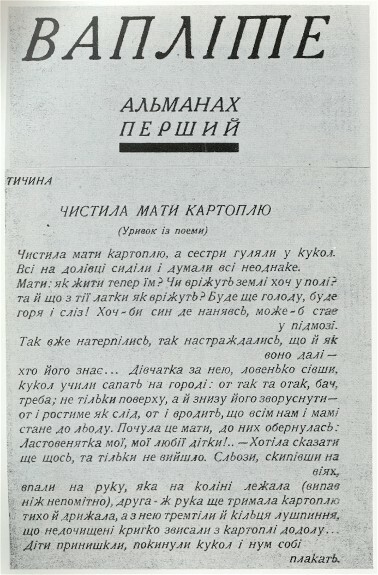 Kruk, Roman Jakobson, Antin Pavliuk (Yavir), Les Kurbas, Ivan Vrona, Hryhorii Maifet, and Volodymyr Derzhavyn); an article on literary Paris by the Russian writer A. Gatov; literary translations by Arkadii Liubchenko, Pavlo Tychyna, Valeriian Pidmohylny, and Antin Pavliuk; a literary chronicle (probably by Aleksandr Leites); book reviews; and Vaplite's resolutions (1927, no. 2). The journal and its contributors were constantly attacked by Party critics belonging to the All-Ukrainian Association of Proletarian Writers and Molodniak, particularly by Volodymyr Koriak. The Party forced Vaplite to cease publication after it printed former Vaplite member Mykola Khvylovy's novel ‘Val'dshnepy’ (Woodcocks, pt 1) and a literary article by the nonmember Pavlo Khrystiuk. The sixth issue of Vaplite, containing the continuation of Khvylovy's novel, was confiscated by the authorities at the printing office.